The first part of this strategy is therefore the responsible removal of our combat brigades from Iraq. As we responsibly remove our combat brigades, we will pursue the second part of our strategy: sustained diplomacy on behalf of a more peaceful and prosperous Iraq. The drawdown of our military should send a clear signal that Iraq’s future is now its own responsibility. The long-term success of the Iraqi nation will depend upon decisions made by Iraq’s leaders and the fortitude of the Iraqi people. Iraq is a sovereign country with legitimate institutions; America cannot – and should not – take their place. However, a strong political, diplomatic, and civilian effort on our part can advance progress and help lay a foundation for lasting peace and security. Going forward, we can make a difference on several fronts. We will work with the United Nations to support national elections, while helping Iraqis improve local government. We can serve as an honest broker in pursuit of fair and durable agreements on issues that have divided Iraq’s leaders. And just as we will support Iraq’s Security Forces, we will help Iraqi institutions strengthen their capacity to protect the rule of law, confront corruption, and deliver basic services. Diplomacy and assistance is also required to help the millions of displaced Iraqis. These men, women and children are a living consequence of this war and a challenge to stability in the region, and they must become a part of Iraq’s reconciliation and recovery. America has a strategic interest – and a moral responsibility – to act. In the coming months, my administration will provide more assistance and take steps to increase international support for countries already hosting refugees; we’ll cooperate with others to resettle Iraqis facing great personal risk; and we will work with the Iraqi government over time to resettle refugees and displaced Iraqis within Iraq – because there are few more powerful indicators of lasting peace than displaced citizens returning home. There are those who will try to prevent that future for Iraq – who will insist that Iraq’s differences cannot be reconciled without more killing. They represent the forces that destroy nations and lead only to despair, and they will test our will in the months and years to come. America, too, has known these forces. We endured the pain of Civil War, and bitter divisions of region and race. But hostility and hatred are no match for justice; they offer no pathway to peace; and they must not stand between the people of Iraq and a future of reconciliation and hope. That leads me to the third part of our strategy –comprehensive American engagement across the region. The future of Iraq is inseparable from the future of the broader Middle East, so we must work with our friends and partners to establish a new framework that advances Iraq’s security and the region’s. It is time for Iraq to be a full partner in a regional dialogue, and for Iraq’s neighbors to establish productive and normalized relations with Iraq. And going forward, the United States will pursue principled and sustained engagement with all of the nations in the region, and that will include Iran and Syria. This reflects a fundamental truth: we can no longer deal with regional challenges in isolation – we need a smarter, more sustainable and comprehensive approach. That is why we are renewing our diplomacy, while relieving the burden on our military. That is why we are refocusing on al Qaeda in Afghanistan and Pakistan; developing a strategy to use all elements of American power to prevent Iran from developing a nuclear weapon; and actively seeking a lasting peace between Israel and the Arab world. And that is why we have named three of America’s most accomplished diplomats – George Mitchell, Dennis Ross and Richard Holbrooke – to support Secretary Clinton and me as we carry forward this agenda. Finally, I want to be very clear that my strategy for ending the war in Iraq does not end with military plans or diplomatic agendas – it endures through our commitment to uphold our sacred trust with every man and woman who has served in Iraq. You and your families have done your duty – now a grateful nation must do ours. 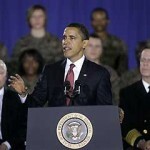 That is why I am increasing the number of soldiers and Marines, so that we lessen the burden on those who are serving. And that is why I have committed to expanding our system of veterans health care to serve more patients, and to provide better care in more places. We will continue building new wounded warrior facilities across America, and invest in new ways of identifying and treating the signature wounds of this war: Post-Traumatic Stress Disorder and Traumatic Brain Injury, as well as other combat injuries. The starting point for our policies must always be the safety of the American people. I know that you – the men and women of the finest fighting force in the history of the world – can meet any challenge, and defeat any foe. And as long as I am your Commander-in-Chief, I promise you that I will only send you into harm’s way when it is absolutely necessary, and provide you with the equipment and support you need to get the job done. That is the most important lesson of all – for the consequences of war are dire, the sacrifices immeasurable. You know because you have seen those sacrifices. You have lived them. And we all honor them. This is a very great speech, however the details included within it that outline the withdrawal of American troup from Iraq are vague and misguided. Pres Obama seems like a good man with a little too much faith in human democracy to work in other nations. The difference is too great to be replicated. I like you on facebook and follow through google reader! lyptrr lyptrr - mulberry factory.